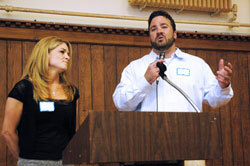 Christianity—not football—defines who he is as a person, Indianapolis Colts center Jeff Saturday told teenage peer mentors for the archdiocesan chastity education program on April 15 at the Archbishop O’Meara Catholic Center in Indianapolis. Saturday and his wife, Karen, were the keynote speakers for the archdiocesan Office of Catholic Education’s A Promise to Keep: God’s Gift of Human Sexuality annual volunteer recognition luncheon honoring the high school students who present the Church’s abstinence education curriculum to middle school students at Catholic grade schools and parish religious education classes. Their presentation on “Living Out Marriage as Christian Men and Women of Faith” focused on the importance of living a moral lifestyle dedicated to Christ, family and service to others. They are the parents of three children—Jeffrey, Savannah and Joshua—and members of Every Nation, a Protestant faith community in Carmel, Ind. During his freshman year at Shamrock High School in Atlanta, Saturday said, an ultimatum from his coaches convinced him to make the right choice to reject peer pressure from the wrong kind of friends then work hard as a student and athlete. That defining moment in his life led him to become a student-athlete at the University of North Carolina, he said, and later a Christian, husband, father, community volunteer and member of the National Football League. Jeff and Karen Saturday have been friends since high school, dated for seven years and were married in 1999. They urged the teenagers to search for and wait for a loving and faithful spouse. She urged the high school students to set moral boundaries and stick to them. Think about your future when you make important decisions, he said. “You have to set a goal of what you want to look like in 10 years and work to meet that goal. You can’t let other things distract you. You have to be bold and strong in your stance. … Everybody here knows that when you start drinking, you make bad decisions. … You need to have people around you that encourage you to live right. Archbishop Daniel M. Buechlein also thanked the teenage peer mentors for their volunteer service to younger students. Chastity peer mentors from several schools also addressed the teenagers.